Jeanette Kowalik appearing before the Common Council’s Public Safety and Health Committee. Photo by Jeramey Jannene. 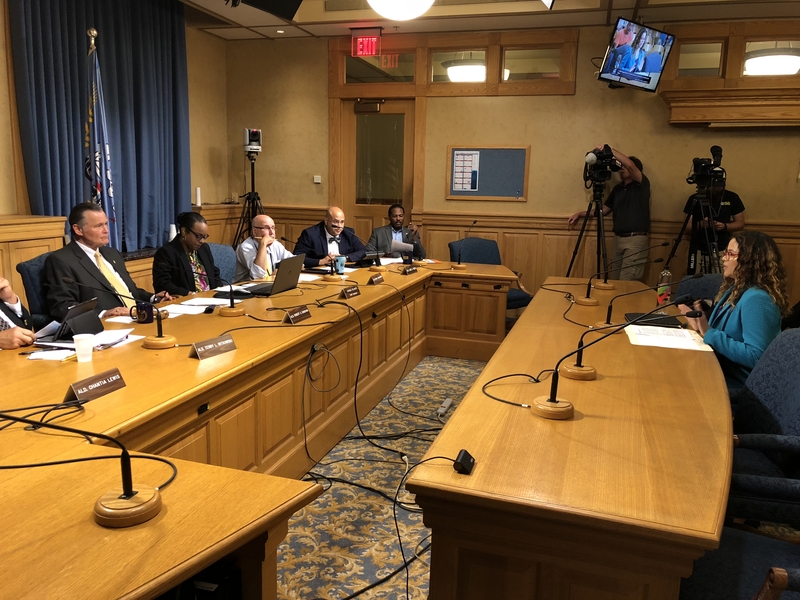 The Common Council and Mayor Tom Barrett appear to have agreed on a new, permanent health commissioner, but the optimism surrounding the candidate won’t immediately end all the issues plaguing the Milwaukee Health Department. The Common Council’s Public Safety and Health Committee concluded an approximately three-hour-long meeting Tuesday morning by unanimously voting to support Barrett’s appointment of Jeanette Kowalik to serve as the Commissioner of Health. Kowalik’s confirmation will go before the full Common Council Wednesday morning. Kowalik would replace interim commissioner Patricia McManus, who was appointed by the council in February following the surprising departure of longtime commissioner Bevan K. Baker. This would be a return to where Kowalik’s career began. She worked at the Milwaukee Health Department from 2002 through 2008 before taking positions in health departments in Wauwatosa, Chicago and Madison, as well as working with a number of colleges and non-profits. Most recently she has served as the Associate Director of Women’s and Infant Health at the Association of Maternal and Child Health Programs in Washington D.C. Her resume lists a bachelors of science degree in healthcare administration from UW-Milwaukee, a master’s of public health from Northern Illinois University and a Ph.D. in population health from UW-Milwaukee. She told the committee that she earned all the degrees while working full time. “Education was my way out of poverty,” she said. The healthcare veteran laid out the biggest challenges she sees for the department, including the hot-button issue of lead poisoning, an emerging problem with sexually-transmitted infections, and the issues of infant mortality and employee morale within the department. Kowalik laid out three strategic priorities. First, to increase accountability, she supports the creation of a citizen-led Board of Health that would oversee the department. She told the committee the board would also work to dismantle racism by ensuring the department’s services are provided in an equitable manner. Second, she would focus on workforce development with the goal of reducing turnover and improving staff effectiveness. Third, she would emphasize the goal of restoring confidence in programs and services. “Reporting and metrics will become the new norm through the establishment of an MHD Data Dashboard,” she said in her prepared remarks. Lewis, one of two women on the 15-member council, added: “It’s just a little something extra that you’re a woman.” Kowalik was one of two finalists for the post. The other was Milwaukee Health Department lab director Sanjib Bhattacharyya. Ald. Michael Murphy also served on the selection committee, which included appointees from Barrett and council president Ashanti Hamilton, and added: “I would say this in jest, but anyone who would want this job needs to get their mental health reviewed.” Murphy, who said the same thing about McManus, publicly warned the interim commissioner that things were so bad between the council and mayor that she should be prepared to serve until the end of Barrett’s term in 2020. Now Barrett is running for reelection and the council appears poised to confirm his selection of Kowalik. A lot can change in six months. “Let there be no question that my authority will be independent,” said Kowalik in response to a question about her control by the mayor. Kowalik said she has made that clear in conversations with the mayor’s office, including her focus on being accountable and transparent. Committee chair Robert Donovan praised the public relations effort to secure her appointment. “I don’t know who is doing your campaign work, but I sure as hell could have used their help on my last campaign.” Upon learning it was an anti-tobacco group, Donovan, a smoker, laughed. Still, the former mayoral hopeful and frequent Barrett critic was impressed with the effort. “In my 18 years, I have never seen a stronger effort to advance a commissioner than the one that is behind you,” said Donovan. McManus, who has been presenting updates on her progress to the council, described a department with a dysfunctional culture, severe staffing shortages and broken processes. Describing the oversight of Baker, McManus said: “very clearly there was this rule, if you were in charge you get to do things.” She said managers were hired because of “who they knew” and that there was extremely limited accountability. At issue with Baker’s departure was an alarming lack of control over records related to lead poisoning. McManus admitted she hasn’t been able to fully correct that issue yet, noting that the issue isn’t confined to just the lead cases. McManus found herself embroiled in another possible misunderstanding when it came time for questions from the committee. “I’m going to try to keep this simple because I’m a simple guy,” said Ald. Mark Borkowski before asking about a scathing Milwaukee Journal Sentinel report that found only five homes had been lead abated from January through May of this year. Borkowski said he felt that McManus told him the problem was fixed by July. McManus, who has held the post since February, responded: “Part of this is what I’m getting into. The people that we had there had to be retrained.” She said the US Department of Housing and Urban Development has also slowed the process because they’re reviewing every case. “It took two months for HUD to approve the assessment we were supposed to be doing,” she added. McManus also offered a brief explanation to the committee about the temporary shutdown of the Keenan Health Center, which had generated controversy. The center, the only city-run center for free STI and HIV testing, should have never closed, said McManus. She had ordered nurses to stop providing services she felt were outside of their authority, but the clinic was then closed without her knowledge. “I was not even told the clinic was closed,” she told the committee. McManus agreed to the committee’s request to provide a written report on her findings and recommendations for the permanent commissioner. Her remarks were followed by a round of applause by the packed committee room.